Simply one of the finest English Lavenders. Get an instant cottage garden look with these winter hardy English Lavender plants. Their fragrant foliage and long-lasting summer flowers will fill the air with a restful perfume every time you brush past them – they grow to approx. 45cm (18in) tall and spread to approx. 60cm (24in) across. 20 x Lavender Hidcote AGM – Named after the world-famous garden in The Cotswolds and awarded the prestigious RHS Award Of Garden Merit, this compact variety is perfect for edging a pathway. These super-sized, Garden-Ready plants provide you with fast results for the minimum amount of effort. We have selected a proven winner with phenomenal flower power, and lovingly nurtured and grown them on so they are ready to plant out immediately you get them. They will deliver you fabulous and long-lasting displays - just plant them in your pots, hanging baskets or beds and borders and look forward to great displays with absolutely no fuss. Supplied as one tray of 20 garden ready Hidcote Lavender plants. In late summer, clip the plants back lightly after the flowers have faded to encourage more growwth - cut the stems back by a few inches, but not so far that the stems are bare of live foliage, and plants will then have time to produce new shoots before winter dormancy. Best planted between April and when the soil is warming up, ensure that the plants gets really good drainage and there's no need to improve the soil as lavender thrives in any poor or moderately fertile conditions. 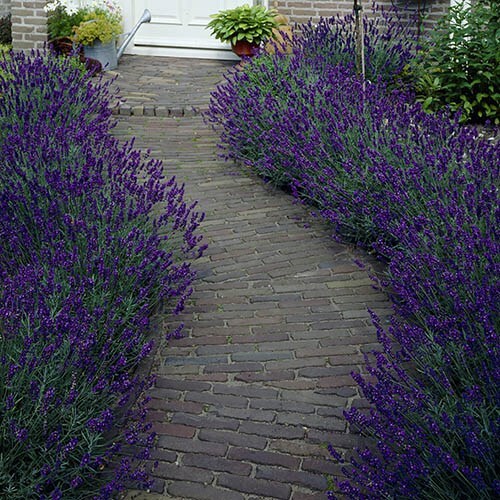 Lavenders should be pruned every year to keep them compact. On established plants use secateurs to remove flower stalks and about 2.5cm (1in) of the current year’s growth - usually in late summer, after flowering - making sure that some green growth remains. You can prune lighty in April if required.